Overlays are printed on specialty plastic film — one side is frosted to provide excellent light dispersal making them ideal for lighting purposes. We use Epson printers to ensure proper, opaque blacks. Our film is also different than that which most vendors use — the image is viewed from the unprinted side to ensure maximum durability. These overlays are intended to be used with the custom interior I designed. Click on the links below to downloaded the free plans. 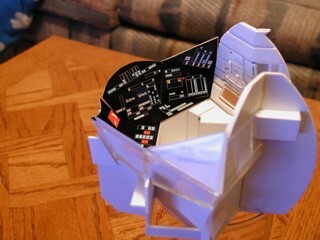 This custom interior is 99% accurate to the interior set and will really enhance an already beautiful kit. Instructions included. Ceiling & A/C Vents UPDATE - adds ring on A/C center.